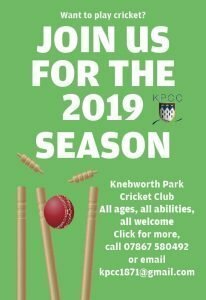 At Knebworth Park we strive to make cricket affordable for people of all ages and from all walks of life. Our philosophy is that no one should be excluded from playing this wonderful game just because they cannot afford it. However, the club does have to survive financially so it is necessary for members to pay an annual subscription fee and match fees for each game played. This money provides the funding for upkeep of our ground and clubhouse, as well as the equipment needed to play. 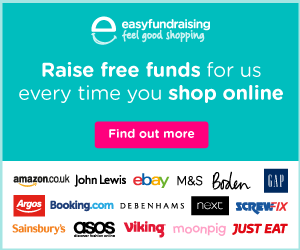 There are a host of other expenses, from teas to administration fees, that we have to cover. We strive to keep all our subs and fees at a reasonable level. There are a number of subscription options to accommodate everyone from those members who want to play every weekend to more occasional players. Juniors and those in education are charged at concessionary rates. 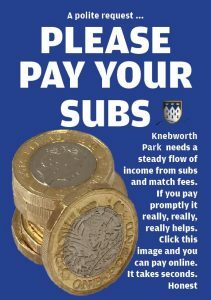 We urge all members to pay their subs and match fees promptly as the club, like any organisation, needs a steady flow of cash, all year round. Annual subs are due by the start of the season. 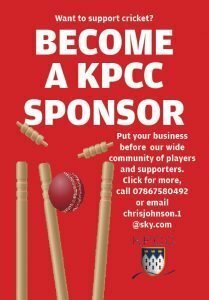 KPCC would prefer it if you pay using our online system, ClubPay. It’s fast and simple. A couple of clicks and you can settle all your subs and match fees here. Please pay promptly; annual subs are due by the start of the season. You can also pay match fees here.